FTC Disclosure: There are affiliate links for products I know and trust scattered throughout this article. If you click through and make any kind of purchase, I may earn a small commission at no extra cost to you. NOTE: This article is the first in a 12 part series about how to start using herbs. This first article will answer: Herb Side Effects and Safety, What herbs are best to begin with? Where should you get your medicinal herbs? How to dry and store your herbs once you have them. Should you be worried about the side effects from herbs? More and more, people are becoming interested in how to care of their health and wellness naturally, with alternative methods. More people are learning to question the “automatic pill” their medical provider hands them, and more people are wanting to have some semblance of control over their own health and body. I know when I first started my own journey into natural health many years ago, there wasn’t a lot of information out there on herbalism, even online. I was so frustrated, and I had no idea how to even start. The problem many beginners today have is: where exactly to start? How do you start using herbs? Essential oils? Which herbs should you choose? How do you find your herbs? How do you choose the right ones for you? And another very important question to ask is, “Can I trust the information from XYZ website? What is the training of the writer? What is their background?” I hate to say this, but there are many bloggers and writers about natural health these days, and many don’t have the years of study and use of herbs that they should have before they start sharing about a remedy, herb, or essential oil. I’ve run across a whole lot of information that is downright dangerous (in my opinion). One thing I recommend every person do is triple-checking the information before making a decision. Don’t just believe one person out there, and that includes me. You can find out what and who my favorite herbal resources (blogs, books, classes, etc.) are in this article. The thing is…you just have to start some place. I’m going to help you get started now by sharing the basics over a series of about twelve articles. Yep. About twelve. And they will be long, but together they will give you a great foundation to get started on your herbal journey. Here’s a rundown of some of the answers you’ll get in this first article about starting your herbal journey in this Part One of the series: How to Start Using Herbs. You’ll learn about what herbs to begin with, where to find your herbs, and how to dry and store your herbs. All right here, in Part 1. What About Side Effects and Safety of Herbs? But first, let’s have a quick talk about side effects of using herbs versus allopathic (Rx and OTC) medications. This is a discussion that is near and dear to my heart because I feel like I have been a victim in several cases over the years when I’ve taken that prescription pill that was handed to me by a physician without truly having full knowledge about what the potential consequences (side effects) would be for me. Like many folks, I trusted my doctors. I believed they knew exactly what they were doing. And perhaps they did, theoretically. But they didn’t know ME, and they didn’t know how my personal body (and mind) would react. Over the decades, I’ve dealt with mistake after mistake made by well-meaning doctors. By educating myself about natural ways to take care of my body and health issues, I’ve been able to hopefully moderate consequences from pharmaceutical and OTC medications that have affected me in the past. I know my health has improved immeasurably over what it was from my twenties (I’m in my fifties now). All the time I hear from people who are suffering consequences from side effects from prescription drugs. An easy and common example is the rampant over-use of antibiotics. Most of us have heard by now how dangerous taking antibiotics often can be. It is now common knowledge they ruin the health of your gut among other negative effects! And yet, I’ve known people who feed their babies and children these pills almost like candy with every sniffle. It’s not because they don’t care about their children! It’s because they DO. But to place blind trust in another human being without doing your own real due diligence is dangerous, in my opinion. And over the counter medications are not much better. Most people assume that if a drug has been OK’d by the FDA that it is safe to use. Many of these drug “approvals” are based on short term studies and corporate greed. Many of these drugs have serious short-term and long-term side effects. Tylenol is a good example of this. Acetaminophen is actually the leading cause of liver failure, causing even more overall harm than hepatitis. It’s also the one of the leading causes of the need for a liver transplant! And there are other OTC’s that are just as bad. It’s important and wonderful to realize that side effects from using herbs are rare. I just think that’s the most fabulous thing! There have only been a small number of adverse reactions to herbs compared with many thousands from adverse reactions to pharmaceutical drugs. It’s important to remember that herbs have been used for tens of thousands of years. In all cultures, plants are the traditional healers, and those who live close to the land have first hand experiences. Herbs can also be generally considered as safe (most of the time) because many are food-like or are actually food. I truly believe that herbs work gently on our bodies to naturally heal and help support all the systems and organs. I also believe God made plants the way He did for a reason: they are not supposed to be picked apart by scientists, where just one chemical is extracted and used (or re-created from toxic substances). All the chemicals within a plant are supposed to work synergistically by design. Rest assured, if you are using GRAS (generally regarded as safe) herbs, you should be fine. Pay attention to any contraindications, and of course, ask your doctor before using herbs. Knowing herbal safety basics and starting out with the most gentle and safe herbs (GRAS), you will build confidence in your abilities and an intuitive knowledge about what works and what doesn’t. In my opinion, herbs are far safer than most Rx or OTC drugs. With knowledge of herbalism, natural remedies (many of which are so very easy and simple), life style changes, and some basic skills, you can start taking control of your own health. A guide to show you how to create your own herb infused salves and balms for health and fun. Keep in mind, herbs can act like drugs, although they are not drugs. They are also unregulated by the FDA, and therefore disclaimers must be declared by those stating opinions about their use. It’s truly up to every individual to make sure they do their own research, and that means double-, triple-, and quadruple-checking information by going to a variety of reputable sources. NOTE: With that said, I am not a medical doctor. I do not claim to be able to treat, diagnose, cure, or prevent any disease. But what I am able to discuss because of my own experiences, study, and opinions, is how herbs have helped me and my family, and share how I personally use them. Also, I would never tell a person not to visit their medical professional. Only you know best when medical intervention is necessary, and I believe the two (natural vs. allopathic) can play complementary and beneficial roles together. This is a lot for one article, but these are the very basic, basic things you need to consider when starting your own herbal journey. I was going to include a detailed list of herbs and their characteristics in this article, but as I started writing about the best beginning herbs to use, I realized this was an entire article in and of itself. Others: Usnea, Echinacea, Skullcap, Passion flower, Hawthorne, Rosemary, Thyme, and there are SO many more that are wonderful for the beginning and experienced herbalist alike. This is where your learning comes in! You can research herbs that will benefit your own special needs. I love Rosemary Gladstar’s Medicinal Herbs: A Beginner’s Guide. She includes many herbs as well as preparations you can make with them. It was the first herbal book I ever purchased, and I’ve worn one copy completely out and am now on my second. I highly recommend it if you want to start learning about using herbs in your own life. This section is about how to go about sourcing your herbs. How can you decide where to buy your herbs? Should you grow them yourself? Should you try to forage for your own medicinal herbs? When I began learning about how to use herbs effectively for our wellness, I didn’t really grow too many. I had basic culinary herbs growing in my yard, which were wonderful. But as I learned more about using herbs for medicinal purposes, I decided to branch out and grow as many as I could that would thrive in our mountain environment. I grew (and grow) calendula, chamomile, valerian, feverfew, echinacea, dandelion (on purpose), yarrow, thyme, oregano, mullein, St. John’s Wort, and many more. I was amazed by how many of these powerful medicinal plants I could grow myself. Calendula is easy to grow nearly everywhere! It has many incredible uses, too. And then, there is foraging. When I began my herbal journey, I lived in the harshest environment in North America: The Mojave Desert. So I set about learning the medicinal properties of the plants in my area. Lo and behold! There were so many I could use effectively! Chaparral, prickly pear, ponderosa pine, juniper, mullein, wild roses, willow by the creek, and even mallow. There are plenty of others, too. Now, for these past five months, we have lived in a completely new environment and ecosystem here in N. Idaho, and I must admit I do miss my Mojave plants. However, I have a whole new world of plants to forage in the Mountain West! Usnea, yarrow, all kinds of pine/fir/spruce (evergreens), wild roses, plantain, St. John’s Wort (a wild weed here), comfrey, goldenrod, balsam root, and I know I’ll keep learning about even more. I guarantee you have herbs growing in your area that you can forage too! Grab a good plant identification and foraging book, and go experiment. You can find out more in this article: 15 Tips for Safe Wild Harvesting and Foraging Medicinal and Edible Herbs. The Bottom Line: Take stock of your garden zone and your particular ecosystem. There are books available to help you identify and forage for herbs in your specific area. Go out and take a look at the wild plants all around you! Experiment with growing your own. You’ll be so pleasantly surprised by what you can gather without buying your herbs. Where on earth can you find that herb that won’t grow in your area or is not wild? Well, there are some wonderful bulk herb suppliers out there. There are companies that take sustainability seriously and provide high quality herbs to the consumer. One thing to note: If you are buying from a large company, buy organically grown herbs if they are available. This ensures purity. You don’t want to be ingesting agri-chemicals, etc. in your body. My favorite company to purchase herbs from is Starwest Botanicals. I have found over the years that their customer service is exceptional, their website is easy to use, and they have a vast supply, organic options, preparation options, and quantity options. Their shipping is the fastest of the companies I’ve experienced too. I happen to be an affiliate for them, but this does not change my opinion, and if I were not an affiliate, they would still be my first choice for herbs. You can also take a look at Mountain Rose Herbs. They have a terrific educational website and are a good company with high values. Frontier Co-op is also a quality company. The Bulk Herb Store is another option, but I’m not sure if they are back to selling bulk herbs yet. They made some shifts recently, but check them out! If I need to purchase herbs, my favorite places to buy them (if possible—-as there were none in Nevada when we lived there) are from local small farms. You are going to get the best quality, fresh product you can besides foraging and growing your own. You’ll also know exactly where and how that herb was grown. There are small herbal growers in many states. I love to support the local farmers, and I do so whenever I can. You can find out where small herb farms are in your area in this link: Small herb farms by state. Some small farms, like Traditional Medicinals in Oregon or Horizon Herbs, will ship all over! Lavender can often be found in farmer’s markets and local growers often sell it too. Amazon has a great supply of herbs from around the world. I recommend if you use Amazon for your herb purchases, research the company first and choose organic. You may pay a little more than another company, but it is worth it. If you see the label, “wild-crafted” or “wild-harvested", this means the herb was harvested from the wild. This is both good and bad, and it’s where you need to be aware of the values of the herb supplier. Wild herbs can sometimes be more powerful than cultivated herbs because they are growing in their own natural environment and are dealing with often harsh conditions. This strengthens the plant. However, there are companies that don’t pay attention to sustainability and they will over-harvest an area. Goldenseal, for example, is an herb you should not purchase wild-harvested. Buy this herb organically grown. So, be sure to do a little research to find the best general companies to buy from. Maybe you are fortunate enough to live near a store that carries bulk herbs. These can be a wonderful resource, and the sales people generally have at least a little knowledge. In my experience, these kinds of shops are usually in larger cities, though. We had one (in all of the Las Vegas proper) that I was aware of in S. Nevada that carried a good selection. I started out purchasing from them. However, once I started buying in bulk from the online companies, I quickly realized the quality of the herb from the local shop was very poor in comparison. Again, with experience, you’ll get to find out where to buy the best herbs for you. I hope this section gave you a good idea of all the places you can find herbs to use for your health! Obviously, my favorite ways are growing and foraging, because you are hands on with your wild and cultivated plants. But if you are just starting out, growing or foraging may not be comfortable or possible. I get that. Purchase from reputable companies, and you can’t go wrong! If you are purchasing your herbs, then it’s likely they will already be dried for you. So you won’t have to worry about it! However, if you are foraging or growing your herbs, or if you are lucky enough to find a local farmer that sells fresh herbs, you will most likely need to dry them. Some herbal preparations work just fine with fresh herbs (water infusions, tinctures, poultices, etc. ), but it’s likely you’ll want to dry some for later use. There are entire tomes written about how to dry herbs, and honestly, I think this knowledge is simple enough to include here in this article. This is the simplest way to dry your herbs, and is one I use a LOT during hot summers. It takes a few days, and if you have bugs, you may want to cover the plants with another towel. This method works best in dry climates, but if you have humidity, it can still be an option for leafy, tender plants. You’ll know when they are dry when they are no longer moist and pliable. If you are drying fragile plants like chamomile or fever few that are likely to drop their leaves, I love this way of drying them. Just tie up a bunch of plants by the stems and place them upside down in a paper bag. Tie the bag at the top with twine and hang in a place where there is air circulation. Any plant matter that drops will drop into the bag! You’ll retain all the plant material! Simply hanging your herbs to dry is a great way to dry them quickly and enjoy how they look at the same time! You can also place your herbs in a good dehydrator that has an “herb” setting. Drying herbs requires much less heat and time than drying fruit and vegetables, so most quality dehydrators will have a special setting for herbs. I love my Excalibur nine tray dehydrator. It is seriously one of the best purchases I’ve made in all these years, and it gets used for all kinds of foods and herbs all spring, summer, and fall. You can dry any and all of your herbs in a dehydrator, but again, if the herbs are very fragile (like chamomile), you’ll want to pay close attention to them as they dry so you don’t overdo it. **NOTE: I’m always asked if you can dry herbs in an oven. I don’t recommend this because most ovens don’t have low enough temperature options. You’re likely to end up cooking them! If the herb is more substantial, you can group them, tie the ends, and hang them up around your home. This is a great way to dehydrate your herbs if you are in a drier area or if you have space to hang them. You’ll find herbs hanging around my house in all kinds of places. We had beams in our home in NV, and I often hung the plants I grew and foraged from them. It made for a pretty interesting looking place! Proper storage of your herbs is very important to the life of the herb. There are several “killers” of the quality of an herb, and for the longest length of usefulness, you’ll want to take these all into consideration when deciding how you are going to store yours. One note about dried herbs: The whole herb is the best way to store them, if you can. Next best is cut and sifted, and finally, powders will degrade the fastest because there is more surface area of the plant exposed. Heat will degrade your herbs. So, it’s a great idea to try to find the coolest place you can to store your herbs. The best temperature range to store your dried herbs should be between 50 and 70 degrees, ideally. If you have a cold storage room, that works great! No worries if it’s a little cooler or warmer than ideal. That’s just a recommended range. Don’t store your herbs near a heater or in the kitchen where it’s likely to be on the warm side. Windows are also not a good idea for herb storage. Light and Oxygen will degrade your herbs. Sunlight is wonderful for giving us a tan, but it’s terrible for your herbs. Sunlight and oxygen will affect the quality of your dried herb faster than almost any other factor because they quickly oxidize the plant matter. 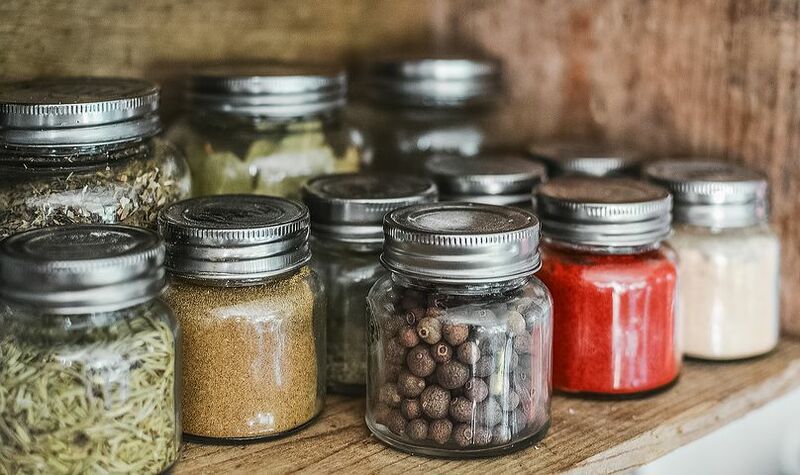 Keep your herbs stored in an airtight amber or clear glass jar or bottle in a cool, dark room or shelf. Make sure the lid fits tightly. Sometimes I’ll even include an oxygen absorber in my jars after removing them from the packaging, and especially if I dried them fresh myself. Be sure your herbs are stored in airtight glass jars, in a cool and dry, dark place for the longest length of life. Moisture will degrade your herbs. If you live in a humid area, there is a much greater likelihood of the herbs not lasting as long. If you can find a nice, cool, dry room to store your herbs, you’ll increase the life span of your dried herbs. Time will degrade your herbs. The length of time an herb has been stored, even if it’s been stored properly, has a great impact on the effectiveness of that herb. If stored the right way, dried herbs can be stored one to three years from the time of harvest, depending on the herb. Once you start using herbs, you’ll develop an intuitive sense about whether or not your herbs are still useful, fresh, or stale. You can find out more about Common Mistakes New Herbalists Make in this article. The closer to the harvest date you use your herbs, the more effective they will be. Eventually, you’ll get to identify most of the dried herbs you use often easily, but when you are first starting out, labeling is crucial. It’s also crucial if you are living with other people who may get into your herbs! Trust me on this. You can also add the date you might want to take a look at it for possible discarding or composting. If it’s a root, it’s likely to last much longer than, say, Chamomile flowers and leaves. I am not fancy about my labels. I usually hand write them. Or, if I purchased them from a bulk supplier, I’ll just cut off their label and tape it to the jar. Then I’ll write any extra info I want on it. I was thinking about how I started my own herbal journey many years ago, and I admit: It was a bit willy nilly at first. I was frustrated because I couldn’t find any information online back then. I had to figure things out myself, as I went along. Suffice to say, I made ALL the mistakes! And I learned from them, too. I’m hoping this series on “How to Start Using Herbs,” will help you over the humps and inspire to you to get going on using herbs for your health! Stay tuned for the next installment: How to Use Herbs 101 Part 2: Herbal Safety Practices and Dosages. I’m hoping to have it ready by next week! Oh—-and if you have questions, comments, advice…please leave a comment! And stay tuned as I finish the rest of the series! If you are interested in starting a more formal herbal education by taking courses, I recommend The Herbal Academy of New England. They have courses for everyone and every level and interest. P.S. I hope you’ll sign up for our newsletter and never miss a thing! You’ll also get free access to the Resource Library when you do! You’ll love what’s in there, including this eBook on How to Relax Using Herbs!